Where does Proksa go from here? By Eric Thomas: Poland’s Grzegorz Proksa (28-2, 21 KO’s) took an embarrassing beating from WBA World middleweight champion Gennady Golovkin (24-0, 21 KO’s) in losing by a 5th round knockout last night at the Turning Stone Resort & Casino in Verona, New York. Proska, 27, did the best he could to be elusive, make Golovkin miss and nail him with hard left hands, but it didn’t work out well for him. Although Proksa was able to land some nice left hands and right hooks in the fight, Golovkin wasn’t bothered by them and he kept landing his thudding shots that Proksa couldn’t handle. Boy, he couldn’t handle them. Proksa was knocked down in the 1st, 4th and 5th rounds in this one-sided mismatch. Kellerman is referring to Proksa’s wins over Sebastian Sylvester and Kerry Hope. Proksa made it look easy in beating Hope in their rematch this year in July, and he totally dominated Sylvester in October of last year. 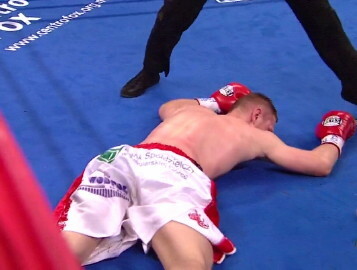 However, Golovkin’s power and accuracy was simply too much for Proksa to handle and he eventually folded in the 5th after getting batted around for five rounds. This loss has got to hurt Proksa real bad, because he was hoping to capture the WBA title and go on and defend the belt against some top fighters. Now he’s going to have to work his way back to another title shot. It’s not definitely not over for Proksa, because he’s got a lot of talent and can still go for, but he’s going to have to pick his fights a little better to avoid guys with crushing power like Golovkin. Proksa has the power to beat pretty much all of those guys and his defense should keep him out of harms way to avoid getting knocked out again. Boxing » Gennady Golovkin » Where does Proksa go from here?